I mentioned in yesterday’s diet post that Lose It!, while otherwise pretty awesome, does not include the Hacker’s Diet–proscribed moving average graph of your weight. A moving average graph is pretty crucial for smoothing out the inevitable weight fluctuations that you’ll see when weighing yourself every day. The app I’m using to fill this need is True Weight [app store]. It’s 99¢, though there’s also a lite version with no import / export and limited graph ranges if you really want a risk-free trial. As you can see, the interface is quite pleasant and streamlined. 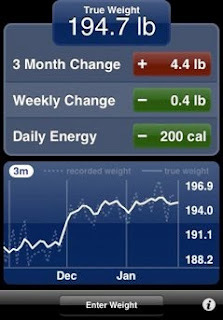 For the calorie-counter, the “Daily Energy” reading is particularly useful. It takes your calculated weight change over the past seven days and does the 1lb = 3500 calories conversion to tell you how much your daily calorie consumption has been under your daily calorie burning. You can then use this information directly to tweak your budget up or down in Lose It!. I’ve been quite happy with True Weight and would recommend it as a great compliment to Lose It!, but, as thanks to Benjamin Ragheb for stopping by yesterday’s post to comment, I’ll mention FatWatch as a graphing-and-analysis alternative. Though I haven’t tried it, if you’re just starting this process (or want to take the import process for a spin) you might want to give it a look. From the tour, FatWatch seems to have more overall features than True Weight, including reporting statistical variance and comparing with a goal line, but it’s comparatively less iPhony-attractive. It’s also $9.99, but Grogmaster Blog readers can take a look at the comments on the last post and maybe get a bit of a deal. Lose It! and True Weight work well together for calorie counting, but as part of this diet I’ve also tried to get a bit more active. The next post will be about, as they say, getting off the couch.